Halibut is a wonderful type of white fish that is more robust than most types of white fish and is simply delicious as is. Add the salsa for a taste of the tropics! The perfect side dish is plain rice made with lite coconut milk instead of broth or water. The combination of the fish and rice topped with the salsa is a perfect pairing! Lime Avocado Oil is being used and can be purchased on-line at Spicewood Food Company. If you want to add a kick to the entree add in their Jalapeño Avocado Oil! The fish recipe ingredients reflect a single serving, but the salsa will serve 4. Increase fish recipe amounts to accommodate your desired menu. Make salsa by gently mixing all ingredients in a medium bowl. Set aside. On a small plate evenly coat fish with lime avocado oil and jalapeño avocado oil if desired and sprinkle with kosher salt and fresh ground pepper. Place flesh side down first on a preheat grill or grill pan on medium high heat and grill on each side for about 3 to 5 minutes. Cooking times will vary depending on the thickness of the fish and the type of grill you are using. 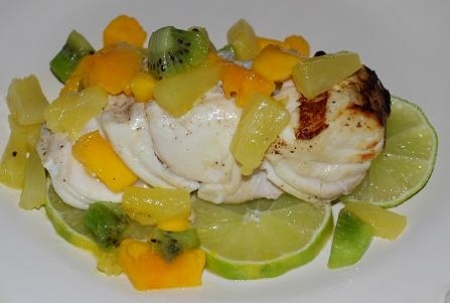 To plate, add sliced limes and place fish on top and add salsa. Make it a decadent meal by making rice made with lite coconut milk instead of broth or water. The combination of the fish and rice topped with the salsa will give you a taste of the tropics wherever you live! Try Pomelo Sauvignon Blanc (California), Brancott Vineyards Marlborough Sauvignon Blanc (New Zealand), Procrastinate Chardonnay (California), a Mojito or a Corona with a wedge of lime.